It’s been twelve years since Josh Fontan and Sarah Gessler formed Beatspoke in 2004. Since then, singer Sarah Gessler and beat maker and producer have released two albums as Beatspoke. Their debut album No Rush was released to critical acclaim in 2009. It caught the imagination of critics, and was hailed as an innovative album. Spinner Magazine Spain went as far as to describe Beatspoke as the “best new act” of 2009. Then as 2009 drew to a close, and the annual awards were handed out, French radio Grenouille called No Rush the “best debut” album of 2009. For Beatspoke, and what they described as their unique brand of future vintage soul, the future looked bright. Especially considering how No Rush had been received within the the Nu Beats and soul communities. Nu Rush was a fusion of the two genres. So two disparate communities sat in judgement on No Rush, Beatspoke’s manifesto for slow living. They were both impressed by music that wasn’t just moderne and innovative, but paid homage to the classic soul sound of yesteryear. Beatspoke’s contemporaries and peers realised that here No Rush was a groundbreaking album. So did promoters and festival bookers. Soon, Beatspoke were rubbing shoulders with some of the biggest names in the Nu Beats and soul communities. This included Alice Russell, Bonobo, Dam Funk, Diplo, DJ Vadim, Simbad, Theo Parrish and Wax Tailor. Before long, Beatspoke’s music was being heard by a much wider audience. It seemed that Beatspoke’s star was in the ascendancy. Surely, this was the perfect time for Beatspoke to release their sophomore album? Beatspoke seemed to be in no rush to release their sophomore album. A year and then two years passed. Soon, three years became four, five and six. However, Beatspoke hadn’t split-up. No. They were still touring their impressive live show. During their downtime, Beatspoke were working on their sophomore album, The Journey Is The Destination, which is out now on BBE Records. Many people didn’t realise this. Like many artists, Beatspoke had been working on their album in between live dates. To do this, beat maker and producer Josh Fontan and singer Sarah Gessler brought onboard a few of their musical friends. This included Joseph Derteano, Metropolis and Pumpkin, RQM and Sneaky. They feature on five of The Journey Is The Destination’s ten tracks. So do beats, analogue synths, live looping, harmonies, spoken word vocals, video game controllers, tambourines and Sarah Gessler’s soaring soulful vocal. When all this is combined, the result is The Journey Is The Destination, a musical roller coaster from Beatspoke. Opening The Journey Is The Destination is Seed Of Doubt, which features trumpeter Joseph Derteano. Keyboards are joined by a sultry sounding trumpet and thunderous drums. Then comes Sarah’s soulful, soul-baring vocal. Meanwhile, synths bubble and buzz, fingers click and the trumpet sympathises at Sarah’s plight. Her vocal and Joseph’s trumpet, play crucial roles in bringing the lyrics to Seed Of Doubt to life. The introduction to Untended sounds like listening to a really old, much loved vinyl album. That’s down to the clicks, crackles and pops. Soon, however, Sarah’s powerhouse of a vocal enters. Her vocal has been multi-tracked, so she sings harmonies. Behind her, synths buzz, bubble and meander, drums crack and percussion is added. Their raison d’être is to frame Sarah’s soulful powerhouse. Washes of synths and crunchy drums open Beg and Plead. They’re joined by handclaps and Sarah at her most soulful. She combines power and sass, as her vocal soars above the arrangement. Harmonies accompany her. So do old school, Acid House synths. They’re an interesting addition, and prove a contrast as Sarah struts her way through a sassy slice of Nu Soul. Mellow keyboards open Sink Or Swim, before Sarah delivers a vocal that veers between needy and hopeful. Handclaps, pounding drums and washes of keyboards accompany Sarah, who also adds harmonies. As Sarah delivers her vocal, it’s as if she’s been searching, searching for who she really is. Sometimes, her vocal is full of hope, other times it’s tinged with despair. She experiences a range of emotions, and in doing so, reminds me of Erykah Badu, Ledisi and Angie Stone. On Solid Intervention Beatspoke are joined by hip hoppers Metropolis and Pumpkin. Washes of synths are panned right to left. Soon, beeps punctuate the arrangement, synths buzz and drums crack. Atop the arrangement sits Sarah’s soulful, emotive vocal. She’s joined by a swaggering rap, handclaps and buzzing synths. Later, a sultry spoken word vocal is added. This is just the latest contrasting layer, in track that’s variously edgy, urban, futuristic, soulful and sultry. As Joy unfolds, keyboards play, the arrangement reverberates. Soon, drums crack as Joy features Sarah Gessler vocal that’s variously heartfelt, haunting and emotive. It’s without doubt Sarah’s best vocal on The Journey Is The Destination. Fading Fast sees the return of Pumpkin, who earlier, featured on Solid Intervention. He plays his part in an arrangement that’s starts off, understated. Swathes slow rippling synths provide a backdrop for Sarah’s despairing vocal. It’s captivating. That’s what grabs your attention. Then percussion and drums join slow, deliberate keyboards. Later, buzzing synths are used to add an element of drama. They fill the spaces left by drums and vocal. Later, Sarah adds another of her spoken word vocals. Her vocal is almost a rap, as she adds vampish harmonies, on an innovative fusion of musical genres and influences. Lately features another of the guest artists, RQM who collaborated with The Tape on Hip Hop Is Dead. Again, there’s an old school analog sound, before swathes of synths add an element of drama. They’re a scene setter for Sarah’s deliberate, dramatic vocal. She’s soon joined by RQM. He’s the perfect foil for Sarah, his vocal adding to the drama. Later, Sarah’s vocal grows in power, before she delivers a soliloquy. It’s full of frustration and anger, as she delivers lyrics full of social comment. Sarah’s impassioned delivery of the lyrics are at heart of track’s success. Closing The Journey Is The Destination, is Fortress which features another guest artist, Sneaky. A prolonged stab of keyboard, scrabbling bass, a thunderous buzzing synth and crisp drums provide a backdrop for Sarah’s pensive vocal. Instruments flit in and out of the arrangement. It’s full of contrasts. One minute synths beep and buzz, the next wistful strings play. They reflect the sadness and despair in Sarah’s vocal, as one last time, she lays bare her soul for all to hear. 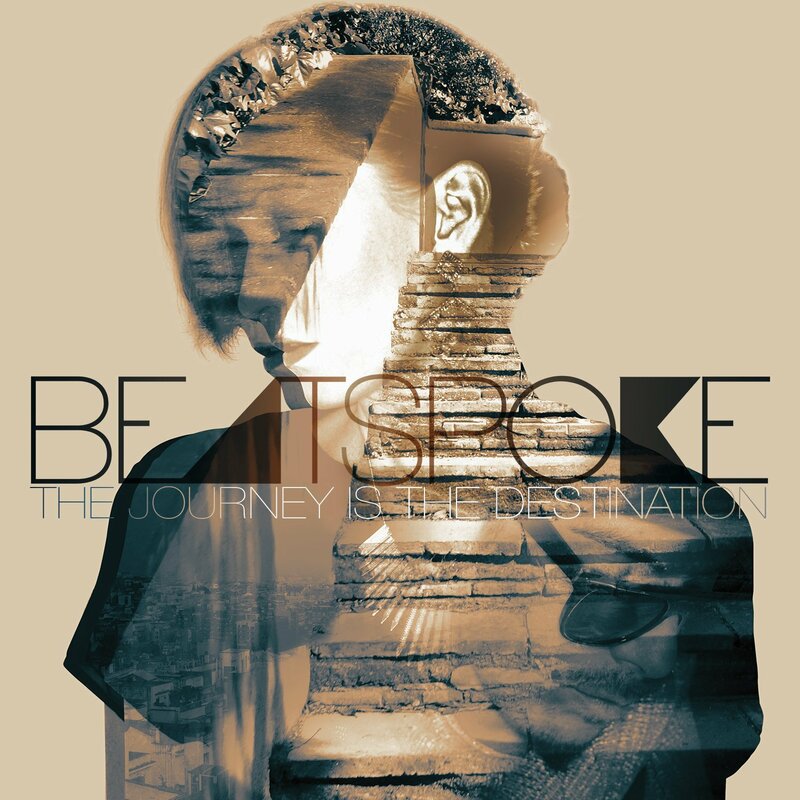 Six years after the release of their debut album No Rush, Beatspoke return with their sophomore album The Journey Is The Destination which is out now on BBE Music. It’s been a long time coming, but features Beatspoke doing what they did on No Rush, fusing disparate musical genres. Just like they did on No Rush, Beatspoke fuse Nu Beats and Nu Soul with electronica and hip hop. They’re four of the musical mainstays that have influenced Beatspoke on The Journey Is The Destination. So has classic soul. Along with Nu Soul, it’s influenced Sarah Gessler as a vocalist .Listen carefully, however, and other musical genres shine through on The Journey Is The Destination. Sometimes, Beatspoke’s squelch synths reference late eighties Acid House. Then there’s Beatspoke’s thunderous drums. They’re a feature of many recent Nu Soul albums. Other times, The Journey Is The Destination briefly takes on an experimental sound. That’s not surprising, as Beatspoke were hailed as innovators following the release of No Rush. They’ve decided to continue innovating on The Journey Is The Destination. Beatspoke it seems, aren’t content to stand still. That’s been the case since they released their debut album No Rush, in 2009. It was released in 2009 to critical acclaim, and Beatspoke were hailed as innovators. Beatspoke’s star was firmly in the ascendancy. Since then, they’ve worked with some of the biggest names in Nu Beats and Nu Soul, including Alice Russell, Bonobo, Dam Funk, Diplo, DJ Vadim, Simbad, Theo Parrish and Wax Tailor. However, Beatspoke haven’t released an album since 2009. So they had no alternative to innovate, again. If Beatspoke released No Rush II, it would’ve been the wrong album, at the wrong time. Instead, Beatspoke had to innovate. So, they headed into the studios, where they recorded ten tracks. Joining them were some of Beatspoke’s musical friends. This included Joseph Derteano, Metropolis and Pumpkin, RQM and Sneaky. They played their part in what Beatspoke describe as their pursuit of “soulful high-fidelity.” Eventually, The Journey Is The Destination was complete and Beatspoke were belatedly back. Nearly six years after the release of their debut album No Rush, Beatspoke were back with their sophomore album The Journey Is The Destination. Six years had passed since Beatspoke released No Rush. That’s not surprising. Josh Fontan and Sarah Gessler, wrote Beatspoke’s manifesto for slow living. They believe in a slower pace of life. This extends to making music. So, who knows when we’ll next hear from Beatspoke again? Until then, Beatspoke’s pursuit of “soulful high-fidelity,” The Journey Is The Destination, can provide the soundtrack to Beatspoke’s manifesto for slow living.